World-renowned architect Frank Gehry was used by Bruce Ratner to gain public and political support for his Atlantic Yards proposal. But on June 4th Ratner officially fired Gehry from the entire project and released a new design for the arena. Actually, only 30 percent of Phase 1 must be affordable, and there's no timeline for Phase 2. SWITCH: 6 acres of inner condo courtyards & the once promised public arena rooftop park is gone. Actually, the statement about six acres is murky. Perhaps more importantly, all the permanent open space would be in Phase 2, which is unscheduled. SWITCH: Zero office space is now planned. When approved, the project was to have space for 1344 jobs but perhaps 375 new jobs. More recently, an office tower of more than 500,000 square feet has been announced--with space presumably for 2000+ jobs--but there's no market for it. The switch from office space to housing might be considered an accommodation to the market. But the office market was already tanking when AY was announced. BAIT: Commitment to buy MTA’s rail yards for the lowball sum of $100 million at closing & construct a state-of-the-art, new rail yard and a platform over the yards. SWITCH: $10 or $20 million at closing and no state-of-the-art rail yard or platform. We'll see discussion of this Monday morning at the MTA Finance Committee meeting. SWITCH: Marisa Lago, CEO of Empire State Development Corporation (the state agency overseeing the project) says it will take “decades.” Nearly half a year after approval Ratner got agreements with City and State to take 6 years to build just the arena, 12 years to build Phase 1 (arena & 4 towers), no timeline for Phase 2 where the bulk of the affordable housing was proposed. 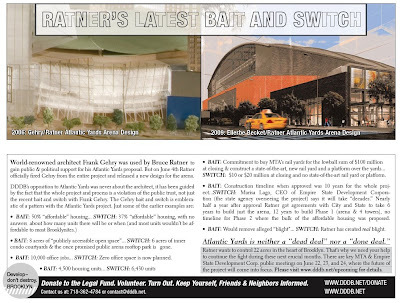 SWITCH: Ratner has created real blight. Ratner didn’t just toss Gehry into the drink; he betrayed the city, blighted a neighborhood he promised to transform, validated his opponents, and blew a colossal opportunity to bring great architecture to a city that badly needs it.